This vignette (article) will describe issues with respect to body mounting Kadee coupler boxes having centerset couplers and using various trucks on selected cars. Moreover, the advent of affordable 3-D printing offers some interesting prospects, particularly with regards to direct fit (devoid of spacers) when body mounting couplers. Compromises may be made according to what is reasonably practical to implement with attention paid to prototype rolling stock being tempered by functionality and operation. Accordingly, examination of the physical attributes and livery of prototype rolling stock is considered in the mix. Examples will be shown with methods used for selected brand car types, and references will be provided for existing vignettes that may describe different car types or differing methods with specific information. My approach is to make a practical and reasoned tradeoff for operational performance while trying to best replicate a prototype car or loco's attributes. In some case a car is so far afoul, like Aristo-Craft's fluted side streamliner passenger cars and Refrigerator cars, both of which are out of proportion, the best thing to do is to mitigate their appearance. I strive for worst case Loco and rolling stock operation down to 8 foot diameter track curves so that operation on 10 foot curves of my outdoor layout are assured. Accordingly, examination of prototype material is first done to see how accurate a particular 1/29 scale car or loco is (including its dimensions and livery) before doing any modifications or installing couplers or changing trucks. Published by Morning Sun Books, Inc. When body mounting couplers, there are a number things to be considered. Typically, for 1/29 "G" scale rolling stock, there are some compromises to make. This scale started out to be toy like with emphasis placed on operation in a garden setting likely having undulating track work and very tight radius curves. This may explain the prevailing tall locos and rolling stock employing hook & loop truck mounted couplers with an excessive amount of coupled separation. In this regard, LGB brand equipment earned a good reputation for their operational prowess on such layouts. The LGB truck with plastic wheels (illustrated below) that is typically fitted to LGB's American standard gauge rolling stock exhibited silky smooth operation. However, over time rolling stock evolved into fairly realistic replicas of prototypes, but many offerings still included trucks with plastic wheels and legacy truck mounted couplers, though in some cases using knuckle couplers in place of hook & loops. Likely due to the scale's historical roots, rolling stock tends to sit tall off the railhead or a car's sides or length are disproportionate when compared to prototype rolling stock. One example shown below is the REA / Aristo-Craft brand Refrigerator cars having overly tall sides with respect to the car's length. Also, the car sits too high off the railhead and employs truck mount couplers. Another example is the Aristo Budd streamliner fluted side passenger cars being notably short in length at about 2/3 the length of what it should be when scaled up to a prototype car. Also, the car sits too high off the railhead and employs truck mount couplers. However, recent production runs of the streamliners have improved lower car height and lessened coupled car separation, but they are still less than optimal. When deciding how to body mount a Kadee coupler, it's behooving to choose a centerset coupler (straight shank coupler having no vertical offset) for not only appearance, but for its improved physics (avoids potential pull apart from leverage action when operating heavy trains). In this regard, best practical choices include the Kadee 906 or 907 assemblies. While Kadee offers #1 scale couplers, its smaller size intended for 1/32 scale rolling stock, is not as operationally forgiving in some outdoor layouts as the lager "G" couplers scaled for narrow gauge rolling stock using the same 45 mm wide track that both 1/32 & 1/29 scales employ. Note: The black finished aluminum boxes shown above I had custom made for me a long time ago by Datum Precision, Inc. The motivation to do this was to afford a favorable coupler height whilst having a super strong coupler box (that accepts Kadee couplers and lid) for mounting on mostly Aristo Locos. The "G" Kadee 906 box is wider than the 907 and has a single spring loaded coupler that can be operationally better than the 907. The Kadee 906 design can offer better overall operation on a layout, particularly when backing up a train, though the Kadee 907 assembly intended for truck mount application (with two coupler springs for self centering) can work well for body mounting when tight fitment clearance is needed owing to its smaller box footprint. Another consideration with respect to body mount coupler box choice is car length. For cars that are very short, such as the Aristo 2 bay hopper and especially for cars that are very long, such as USA Trains passenger cars, the Kadee 906 with its bigger / wider box opening is preferable to the Kadee 907. This is because of how the coupler projects from the end of the car with respect to track on curves. This is mostly a concern for train operation on smaller 8 to 10 diameter track. Looking down from the top of a car toward the track, a very short car's coupler is more toward the center (between the rails) on curves (which is OK for the most part), whereas, a very long car's coupler can project near or slightly beyond the outside rail. Coupling a long car to a short car is the extreme case where the Kadee 906 on both type cars is more tolerant so the cars won't tend to be pulled off the track around the curves. Some cars like Aristo's heavyweight passenger cars with 3 axle trucks have offset asymmetric mounted trucks, whereby, the truck's pivot point on the car is closer to the car end. To good effect, this minimizes the amount of coupler projection for body mounted couplers. (Aristo-Craft, also, used this technique on the U25B Loco.) Because of space limitations, the smaller footprint of the Kadee 907 will fit on this car having 3 axle trucks and yet still works OK when coupled to other cars and Loco down to 8 foot diameter curve track. Based on observation and reference material, an American freight truck's wheel base and spring pack configuration (typically multiple coils) is related to a car's load capacity for both friction bearing Bettendorf / Ride control and roller bearing Barber type trucks. A wheel base of 5 foot, 6 inch is the most common truck for car capacity of 100,000 lbs. (50 ton). A wheel base of 5 foot, 8 inch is typical for car capacity of 140,000 lbs. (70 ton). Less common is 5 foot, 4 inch for a car capacity of 80,000 lbs. (40 ton) that may be found on flat cars with friction bearing type trucks. A wheel base of 5 foot 10 inch is common on 200,000 lbs. (100 ton) cars with roller bearing type trucks. As to commonly available "G" trucks when scale up to prototype, the Aristo Bettendorf truck wheel base is close to a 5 foot 8 inch 70 ton truck, but its 2 coil per side spring pack resembles a 50 ton truck. This truck is universally common to Aristo products that include 40 foot Box, Reefer, Stock cars and 37 foot tank cars, and 2 bay hopper cars (covered & open). The USA Trains Bettendorf truck wheel base is close to 5 foot 6 inch, but its 4 coil per side spring pack resembles a 70 ton truck. This truck is universally common for USA Trains products that include 40 & 50 foot cars and 3 bay hopper cars. Wheel diameter is a factor with respect to car height from the railhead. For Example, wheels from Aristo-Craft/Crest, P/N 29111 with suffix Blank/S/B/D, have a diameter that is about .040 inch more than an AML wheel, P/N R2093. Thus, a car height from the railhead would differ by 1/2 x 0.040 inch = 0.020 inch when wheels are installed in the same trucks. The example wheel set illustrated below is an Aristo 29111D (Currently with the CREST brand name). The "D" version has machined down axle tip hubs to specifically fit Aristo's Barber truck. The wheel itself is virtually the same as the Blank, "S", or "B" version with the difference being finish. The Blank suffix version is brass; the "S" version is bright metal plated; both the "B" and "D" versions are bright metal plated but have a black smoked finish to dull the appearance. Most other brand wheels are painted black like USA Trains wheels. My experience with Kadee's wheels supplied with the Kadee 970, 971 & 973 trucks is that they are gauged to a back to back value at minimum NMRA specification. While it's tempting to re-gauge them a little wider to the "target" value, the prominent wheel's fillet & flange slope can present operational problems on Aristo-Craft's notoriously under gauged No. 6 turnouts where the truck's wheels would ride up on both fillet and flange! To mitigate this affect, I ground the No. 6 turnout point rails and stocks rails where they mate so that the Kadee truck wheels (retaining their minimum back to back value) would traverse the turnout without excessively riding up. Kadee wheels like equipped in the Kadee trucks can be purchased separately in a 4 axle group, Kadee P/N 960. These wheels can be installed in various brand trucks. An example Aristo Truck is illustrated below. Example measurements of the Kadee 960 wheels are depicted in the following illustrations. Because the Kadee wheel includes a prominent fillet, values shown in this area are predicated on determining where the fillet transitions are located with respect to the wheel tread and flange. With respect to Kadee wheel operational problems on the Aristo No. 6 turnout (previously described in "Comment about Kadee Wheels"), the dimension between the wheel backside and the flange periphery would appear to have a profound affect on back to back gauging. If the backside area were machined to a lesser thickness (like AML wheels having a similar profile) the back to back gauging would conform to NMRA specifications which they don't appear to as they come from the factory. The Kadee packaging indicates the wheels are applicable for both #1, 1/32 Scale, as well as 1/29 Scale applications having deep flange wheels. The Standard S-4.3 applicable to 1/29 scale has more tolerant values for some of the dimensions which should be prevail over Standard S-4.2 for what is discussed herein. Shown below are S-4.2 & S-4.3 specification excerpts pertaining to this discussion. The attitude of a wheel flange with respect to the railhead is known as its angle of attack that can result from axle skew. Axle skew does not affect car height for mounting trucks and body mounting couplers but does affect car operation. It's discussed here because axle skew can be mitigated before mounting trucks on a car. How much lateral play axles have within a truck affects its operation on curve tracks resulting in drag and possible car derailment when traversing into a turnout's point rails. This is because the axles "walk" to opposite sides within the truck as it traverses along a curve track. This results in a couple of wheel flanges pointing more so toward the inner side of the outside railhead; thus, the axles are skewed such that its wheel flange is at an angle that "attacks" the railhead. The example shown below is an Arsito-Craft Bettendorf truck with ART-29111B metal wheels. Axle skew can be mitigated by adding spacer washers on the axle tips that was done on the truck as shown below. It's behooving to correct axle skew before mounting the truck on a car. Other brand trucks may exhibit excessive axle skew, too. The AML short wheel base Bettendorf type truck is probably the worst offender of any brand I have seen to date. However, the wheel sets in the latest production version of this truck shown in prior examples have a profile with prominent wheel fillet and flange slope that significantly reduces operational problems. The Kadee brand metal wheels are esthetically superb and have an excellent profile, too. However, the thickness of the Kadee wheels near the outside periphery of the flange takes up more space that seems to limit what can be done with gauging with regards to operational problems on Aristo's No. 6 under gauged turnouts (out of NMRA spec.) as previously described. For the majority of the most common applications, the USA Trains truck or Kadee aftermarket trucks represent the better selections with respect to prototype replication. The USA Trains truck is comprised of the truck parts only so a user could choose a different brand wheel set. The USA Trains Bettendorf truck (P/N R2033) with separately sold USA Trains wheels (P/N R2093) at a relatively low cost offer the most pragmatic choice for modifications when needed. The bolsters & side frames can be readily modified for lowering a car's height to be more prototypical whilst at the same time minimizing or possibly eliminating the use of coupler box spacers when body mounting Kadee couplers. Since this USAT truck is made of plastic (apparently Nylon) it can be cut where needed using a razor saw and cleanup using a file. LGB's American Standard Gauge 1/29 Scale Trucks & Mods for Car Lowering. As to the LGB Roller Bearing truck used in the American standard gauge 40 foot type box cars, it's mostly inappropriate with respect to prototypes. Substituting another brand's Friction Bearing trucks can be done while at the same time lowering the car to a scaled prototypical height from the railhead. On cars I selected to mount Kadee trucks, I chose to avoid the use of the Adaptor kit base plate as intended by Kadee in order to keep the car height from railhead to a minimum. USA Trains and AML cars have a rounded floor bolster from which a truck pivots against with minimal contact, so If and when the Kadee truck's side frame should twist by design while the truck is pivoting during car operation on a layout, there would be minimal affect. An Aristo car can use the USA Trains adaptor kit with the base plate having a bigger hole so when installed it fits beyond the base of floor's mounting post, thus, becomes physically closer to the car floor compared to using the Aristo adaptor. A car's under frame or floor design affects how body mounting Kadee couplers are done and how retrofitting trucks to a given brand car is done (if done). With respect to Aristo-Craft 40 foot type cars, there are 3 generations of removable floor assemblies that are described in the following illustrations. The Aristo 2nd Generation floor is designed such that when mounting a Kadee 830/906 box, it will protrude out being more appropriate to a later era "Hydra-Cushion" or "Shock Control" car. For prototypical appearance on Aristo's 40 foot type cars, the coupler box face should be somewhat flush with the end bulkhead of the car. The factory mounting hole locations for the Kadee coupler box appears to have been chosen so the Aristo truck (devoid of coupler) could be remounted 180 degrees on the floor bolster so it would not interfere with the Box without having to cut off the truck's coupler tang and tail extension. What's more, the mounted height of the Kadee coupler would not align with the Kadee 880/980 Coupler Height Gauge. The following illustration describes modifications to correct the floor. As an alternative, the coupler box can be saddle mounted by its two side ears. Centerset couplers (no vertical offset of knuckle from shank) are preferential to use, not only for their appearance, but for better tolerating the physical forces when employed in a heavy train. When body mounting centerset couplers, spacers may be needed, or cars & locos may need to be lowered (rarely raised) from the railhead so couplers will properly align with a Kadee coupler height gauge. This is important because proper coupler alignment ensures compatibility between different train product brands. The centerset Kadee 789 & newer 907 type boxes typically used for truck mounting can be used for body mounting, particularly in confined areas of a car's underside because of the box's smaller foot print compared to a centerset Kadee 830 & newer 906. That said, the Kadee 830 & 906 wider box with extendable coupler when in tension can be more forgiving for some extreme operational conditions on a layout. I strive for train operation down to 8 foot diameter track curves. Track "S" bends should have a straight section about the length of the longest car between directional transitions. The Kadee 830 & newer 906 type assembly is typically mounted using its side ears; however, there are circumstances that inline mounting is better for clearance purposes. In most cases only two screws are needed to mount the box. The Kadee 830 and early production Kadee 906 included # 2-56 stainless steel machine screws and nuts. The later production Kadee 906 now includes larger diameter # 4 self threading screws. The self threaded screw may make it easier to mount the box to a car; however, It can be behooving to use # 2-56 screws because they can serve as "studs" if need be for certain mounting applications, and their smaller diameter allows for more forgiving tolerances given the larger hole diameter in the Kadee box. Some example cars made by different companies will be illustrated to show how things can be done. An Aristo-Craft Refrigerator car will be used in the following example. Aristo 40 foot Box cars, Stock cars will be similar. The Aristo Reefer appears to be based on their Box car and as such it's out of proportion having the same height sides as the Box car. Typically, the sides of a prototype Reefer are not as tall as the Box car. The Aristo Refrigerator 40 foot Car is an example of compromises. Again, with respect to a prototype, this car has out of proportion sides (too tall), and as it comes from the factory the car also sits too high from the railhead, which further exacerbates its appearance. As an alternative to "chopping & channeling" the car's sides (which would be delicate and time consuming to do while spoiling its otherwise good graphics in the process) I chose to mitigate its appearance to make it plausible. This is done by lowering the car using Aristo Lowered Floor assembly and then ultimately replacing its trucks with modified USA Trains trucks to lower it even more. The minimal approach is to ensure the car has the lowered floor installed and then mount the Kadee 906 coupler box so it fits without interference with the screw head at the end of the car. Of course, the floor having been prepared (Ribs trimmed on pad for Kadee coupler box) and screws that hold it to the car body must be installed with a snug fit before mounting coupler boxes and trucks. The Aristo 1st Generation floor will need to have the rib (or most of it) removed from the pad and a spacer added. Kadee spacers can be used or an inexpensive spacer the width of the Kadee box and thickness of about 0.110 inch can be cut from a strip of plastic sheet obtained from TAP Plastics. The spacer can be glued to the floor pad and holes drilled and threaded if using 2-56 screws to fasten the coupler box (late production run Kadee 906 kits changed from 2-56 screws to self tapping screws). Shown below is an example 1st Generation floor with glued spacers. The 2nd generation floor will only need its surround type ribbing trimmed down to a lower height of 0.110 inch as previously described. Shown below is an example Pacific Fruit Express (PFE) car on the left with lowered floor and Aristo trucks. The car on the right adds Modified USA Trains trucks to lower it even more. Both PFE cars shown below have flush mounted Kadee 906 coupler boxes (detail to follow). The difference being the brand of wheels sets used in their USA Trains trucks. The car on the left has USAT wheels (P/N R2093) while the car on the right has Aristo Wheels P/N 29111S ("S" for silver, actually they are shinny metal plated). As can be seen above, emphasizing the "white walls" on the wheels, as some of the prototype PFE cars exhibited, further mitigates the tall appearance of the car. 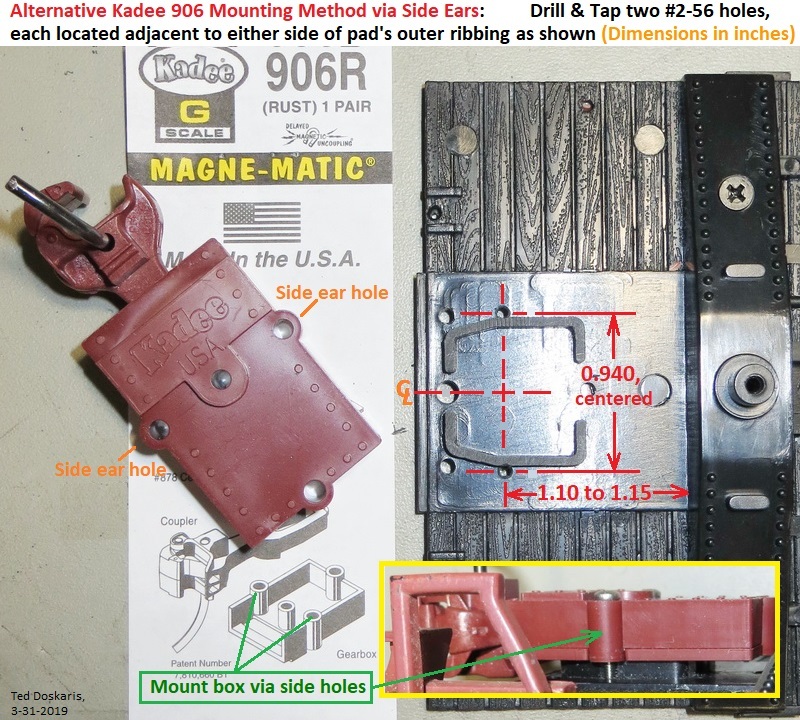 Described in the Illustration below is what's done for flush mounting the Kadee 906 box. In this example, the box is mounted using its two center holes with the longer screw in the front. Shown below is an example Fruit Growers Express (FGE) car. This car is a replica of an Insulated Box Car. The FGE car in the road numbers that Aristo chose to use is accurate with Bettendorf friction bearing trucks, however, I chose to use the Kadee 973 Barber roller bearing trucks that were used on higher road number cars that looked very much the same. When mounting a Kadee truck, the screw that fastens it to the floor post must be longer than the original Aristo truck mount screw because the surface of the Kadee adaptor "Hat" is somewhat thick. (The Hat not only is the primary means to keep the truck side frames from separating, it's the means to mount the truck, too.) The Hat's shank is designed to envelope the floor bolster post. In the event the floor post is split as some floors came from the factory that way, the Hat also serves as a remedy. The replacement screw thread pitch should be similar to the original Aristo screw as shown below. 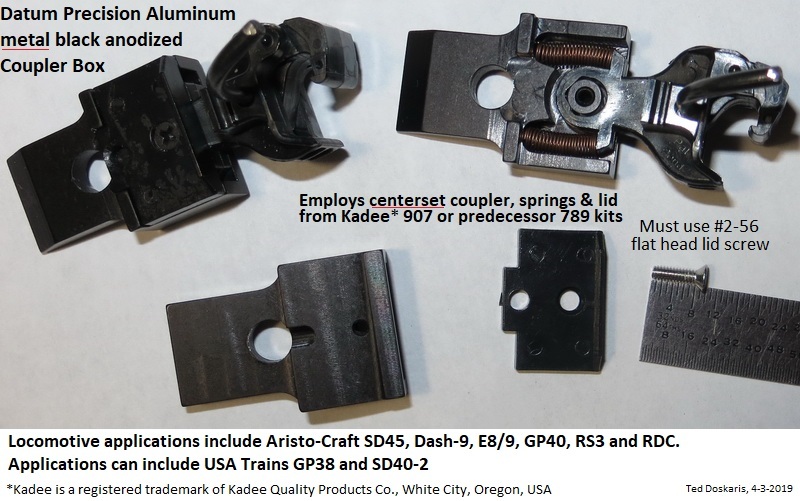 As illustrated above & below, the Kadee USA Trains Adaptor including base plate (NOT the Aristo adaptor) is used for truck mounting. The USAT adaptor base plate hole just happens to be large enough to exactly fit over the truck bolster post's base area. As such, the car becomes lower to the railhead when compared to using the Aristo Adaptor. By design, like the 40 ft. cars, the 50 ft. cars have floor pads with holes intended for mounting Kadee 906 type coupler boxes. Kadee 906 coupler assemblies are installed on these cars, however, the sides of the coupler boxes must be notched to clear wheel flanges for operation on 8 foot diameter curve truck (10 foot diameter for Mechanical Reefer car when equipped with Kadee truck due to its wheel properties). The USA Trains 50 foot Reefer car example described is suppose to be a replica of a Rio Grande car. Since D&RGW did not actually roster a mechanical reefer car, but did roster a similar 50 foot plug door box car, the replica's livery appears to be modified to be plausible. Kadee 973 Barber Roller Bearing Trucks are fitted to this example car in place of the USA Trains Friction Bearing Trucks. So as to keep car height from railhead to a minimum, the Kadee 973 Adapter Kit's base plate will not be used. Described in the below Illustration is what's involved when fitting the truck to the car. A prototype express car is often lower in overall height than a conventional freight car since it is used as a head end car on a passenger train. Moreover, Union Pacific railroad paid attention to the esthetics of its streamline trains to the extent of matching its livery to be like the passenger cars as well as the height of the car being similar to the passenger cars. To mitigate the tall appearance of the USA Trains car in a passenger train, I chose to lower it to its maximum practical amount which is 1/8 inch. In order to lower the car to its maximum, the USA Trains friction bearing truck was "lowered" and the Kadee 906 coupler box cover plate was eliminated. The coupler box, also, needs to be notch on its sides for wheel flange clearance when operating the car on 8 to 10 foot diameter curve track as illustrated below. To lower the car, its trucks were "lowered" 1/8 inch. Refer to the previous shown dimensional drawing for specific dimensions to modify USAT truck to lower car by 1/8 inch. Compared to prototypes of this 40 foot car, it's basically OK with the as supplied USAT Friction Bearing trucks. However, the decision was made to replace the factory trucks with Kadee 971 Bettendorf trucks even though the script on this USAT car's end bulkhead indicated "Roller Bearings". Examining prototype material showed the road number on the USA Trains car was actually applicable to a longer, later era car having roller bearings. Though railroad companies are known to renumber equipment , this did not prove out as far as could be determined with respect to the USAT car's number; so here is an example of what appears to be a transitional livery that subsequently did away with the round herald. From what could be determined, double door box cars seemed to be more prevalent with the livery of the USAT single door car. That said, a single door car was found with this livery, albeit with Youngstown corrugated door. Described in the below Illustration is what's involved when fitting Kadee 906 couplers and Kadee 971 Bettendorf friction bearing trucks to this USA Trains car. AML cars are supplied with truck mount unique AML knuckle couplers. Coupler boxes that resemble Kadee boxes may also be supplied with the car as a user installable option. Accordingly, the car's floor already has pads with holes that can be used to mount Kadee 906 type boxes. This car is factory equipped with metal AML Friction Bearing Bettendorf type trucks. Examining prototype reference material with respect to this car's road number indicated it was among a road number series built around 1957 that were early adopters of Roller Bearing Trucks. Consequently, Kadee 973 Barber Roller Bearing trucks were installed in place of the AML factory trucks. Described in the below Illustration is what's involved when fitting Kadee 906 couplers and Kadee 973 Roller Bearing truck to the car. Custom boxes have been developed that are made from CNC machined metal and 3-D printed plastic resin that make for easier mounting, mostly without the need for spacers, hence, direct fit. Shown below are direct fit metal boxes designed by me (Ted Doskaris) that utilize Kadee centerset couplers for selected locomotives. 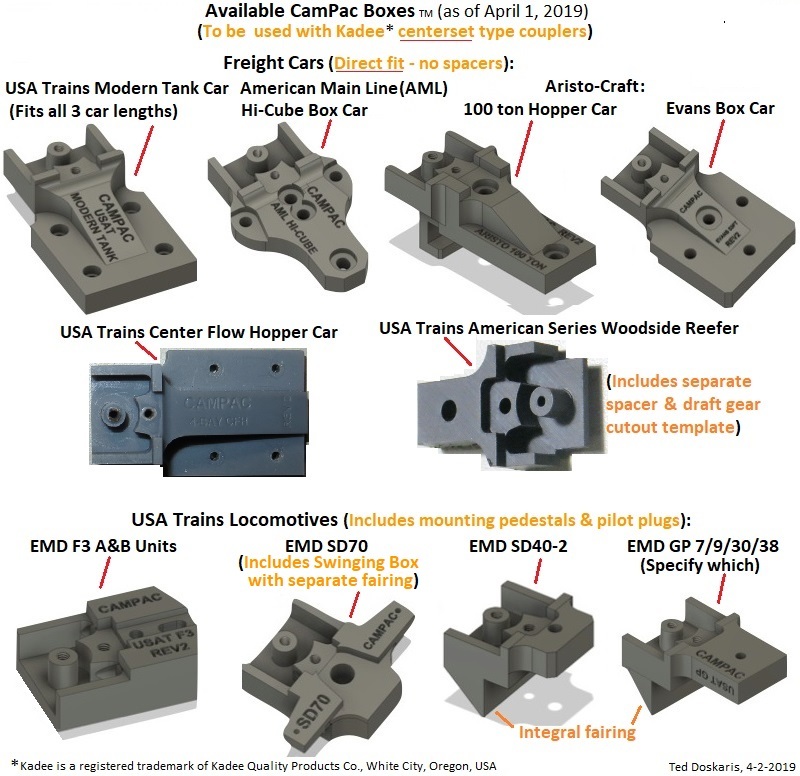 Shown below are direct fit 3-D printed plastic "CamPac BoxesTM" that utilize Kadee centerset couplers for selected cars and locomotives - jointly designed by me and Colin Camarillo who has the 3-D printer and software expertise to implement the designs. These boxes employ coupler, springs & lid from Kadee 907 kit - except USAT American Series Woodside Reefer from Kadee 789 kit. Custom coupler boxes can be obtained from Colin Camarillo via his Web site at cost shown. Note: Other references may be added at a later date.